Friends, family and co-workers gathered from across the country to dedicate a room at the William W. Winpisinger Center as a memorial to former Winpisinger Center Instructor and IAM Representative Anna Samick. Samick’s son Michael, right, was one of many to share their memories of Anna. 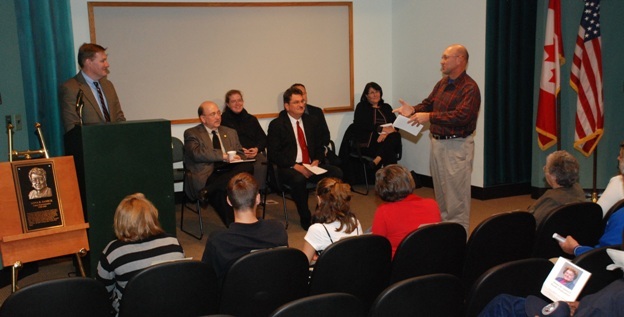 Others who shared stories of Samick’s memorable career included Winpisinger Director Chris Wagoner, left, IAM President Tom Buffenbarger, seated at left, and Eastern Territory Education Representative Donna Perinetti, seated far right. Friends, family and co-workers gathered at the William W. Winpisinger Education and Technology Center to dedicate a memorial to Anna Samick, the first female business representative to teach at the Center and one of the IAM’s pioneering female union leaders. Samick joined the IAM in 1972 when she worked at McGill Manufacturing. She was one of the IAM’s first female Business Representatives after being elected to that post in 1980 at District 72 in LaPorte, Indiana. In 1986 she became the Directing Business Representative and then moved to District 90 as a Business Representative in 1993. Samick joined the Winpisinger Center staff in 1994 and then moved to the Eastern Territory in 1999 as the Territorial Education Representative. Samick retired in June, 2000 and passed away in January, 2003.